Well, look what I’ve just got for you. It’s Easy French Onion Soup Recipe. Don’t be intimidated by French cooking, because this easy twist on a French classic will make you believe that sophisticated cuisine doesn’t have to be a rocket science. Watch the video above the recipe card to see what I mean. My first trip to France was in the middle of 2000s. I vividly remember my excitement and joy from going to one of the most beautiful countries in the world. The country, that I still consider to be my favorite. Beautiful Baroque architecture, drenched in history streets of Paris, melodic French language and of course mouthwatering and top notch French cuisine. All of this has left a significant impact on the shaping of my culinary and cultural preferences. From that moment on I fell in love with European food, culture and everything Europe related. That’s why I dedicated this blog to the most delicious European recipes. And you my friend, if you popped onto this page, I believe that you’re just like me obsessed with French, Italian, Spanish etc cuisines. And for you, there’s nothing better than a good cheese plate with a glass of Pinot Grigio or a bowl of creamy Mustard Chicken followed by lighter than air Lavender Creme Brûlée. Am I right? If you said “yes”, here’s the good news. You’re in the right place to find all these mouthwatering recipes. And if you came here for the Best French Onion Soup Recipe Ever, you’re in the right place too. Just check the video below to see what I mean. We’re all busy people and many of us are busy moms, who can’t afford to spend hours in the kitchen. That’s why most of my recipes are easy yet absolutely mouthwatering. See my guide on How to prepare 3-course French dinner in under 90 Minutes. It is totally doable. Speaking of French Onion Soup Recipe…the chances are that somehow somewhere you’ve already tried it and want to recreate its taste and flavor at home. Or, maybe you’ve never tried this soup, but heard rave reviews about it and would love to try it too. If you watch a recipe video posted below, you’ll see that I made Chicken French Onion Soup Recipe. Despite that traditionally, beef broth is used, chicken broth is my personal preference. You can make it with any broth you like. In my recipe I used a combo of Gruyere cheese which has a wonderful flavor and Provolone cheese, which melts great. Does French Onion Soup Freeze Well? Yes, you can definitely freeze French Onion Soup. Arrange prepared soup minus bread and cheese among the freezer friendly zipper bags and lay them flat in a freezer. When stored properly French Onion Soup will keep for 3 months in a freezer. When you’re ready to eat your soup, thaw it overnight in the refrigerator or place a bag into a simmering water. Once defrosted, bring the soup to a boil again, then ladle into a bowl, top with baguette, cheese and broil until cheese is nice and melty. I hope I convinced you already. 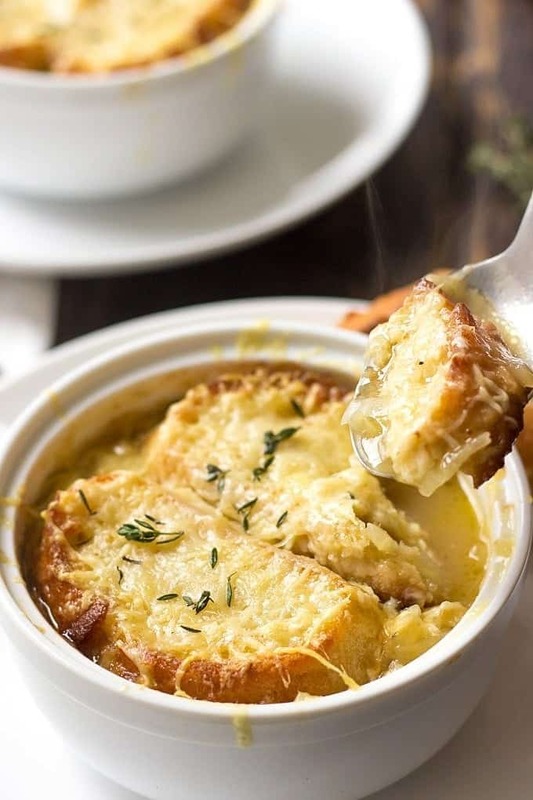 So go ahead, stock up on the ingredients and get Best French Onion Soup Recipe bubbling away. French Parmesan Soup. It’s so good, I literally couldn’t get enough of it. Russian Solyanka. For all meat lovers out there. Perfect winter warmer with so much flavor. Dutch Split Pea Soup. Hearty, flavorful and extremely satisfying. Add broth and simmer with a lid on for 25 minutes. Place 4 ramekins into a rimmed baking sheet and divide soup among ramekins. Top each ramekin with a few slices of baguette. Generously sprinkle with Gruyere and Provolone cheese. Broil for a few minutes until cheese melts and starts to brown. 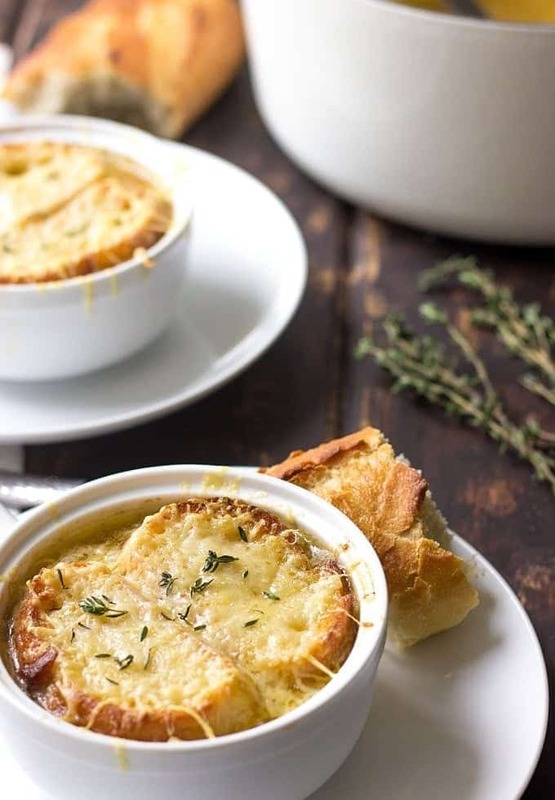 If you make this Homemade French Onion Soup recipe, don’t forget to snap a picture and post it on Instagram with a hashtag #lavenderandmacarons. I’d love to see your creations. Hi! I would love to link your recipe in a blog post that I’m preparing. It’s for a challenge that I designed to do with my 10-year-old daughter, and this soup would be one of January’s dish options. I’d like to embed a picture as well if possible, maybe to use it in the post or in my Pinterest Graphic. Would that be ok with you? Thank you! Hi Flor! As long as the full recipe is not posted, then yes, you have my permission. Thank you for asking! Elizabeth, my apologies for the inconvenience! I was doing some technical work on the blog which resulted in the recipes not being visible to the readers. You should be able to access the recipe now. Let me know if there are any issues. Thank you! I tried this recipe tonight and was not very fond of it. While the ingredients are high quality, I found the final product far too rich and salty. Adding flour seemed unnecessary and made the broth thick, the added salt was redundant as the stock already has salt, and I omitted the sugar as the onions have natural sugars. I was not a fan, but perhaps that is my personal preference. My husband was also not a big fan. He did not hate it, but couldn’t eat more than half a bowl… and he’s a healthy eater. I followed the recipe exactly, except for omitting the sugar. Kelly, thank you for your feedback! Sorry the recipe wasn’t to your liking. I might give it a go again to see if anything needs tweaking. One thing I didn’t mention in the recipe card is that I always use low sodium broth therefore my soup never comes out too salty. I’m going to add this note to a recipe. 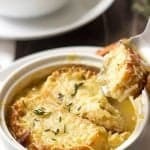 Aside from that, this French Onion Soup is a recipe that I love, make often and have gotten great reviews for. Sorry again it wasn’t what you expected and I appreciate you sharing anyway! Made this tonight using vegetable broth! Yummy! My whole family loved it! Thank you for sharing Steff! I’m so glad you liked the recipe! Rainy in the Midwest so I decided to make some French Onion soup. This recipe was perfect! And so easy…I halved it but otherwise followed it to as written. Used a French baguette and Swiss cheese…delish! Will make again…thanks for a great recipe! It tastes delicious, was time consuming but easy. I prefer The more broth style French onion without the flour. But the taste makes it worth it. Yumm… and yes i chose Toasted homemade sour dough and only Swiss. Plus added some cheese/garlic croutons for a little more flavor in another bowl to try both ! Thank you for the recipe. You’re welcome Kristie! The addition of cheese and garlic croutons sounds delicious! I made this today and it was absolutely delicious! I had been toiling with other recipes calling for Worcestershire sauce, sherry, and I just didn’t like the way it turned out. But this recipe was the best! Thank you for sharing! Making this tonight!! Thanks for the super easy recipe!!! I love the idea of using chicken broth!!! I am making it now! I am on a low salt diet. You can substitute Gruyere and Provolone with some of the low sodium cheeses like Mozzarella, Emmental or Swiss.